Watkins is famous for it's Original Double Strength Vanilla. You'll also find about twenty more versatile, extracts and flavoring, to enhance the flavor of both sweet and savory dishes as well as your beverages too. They are for more than just baking, you will discover 1001 uses for extracts while addding more flavor to your dishes, you are only limited by your imagination and creativity! Shop for your favorite Watkins Extracts and Flavorings on our safe secure Watkins website or go here to Request a free Watkins Products Catalog. Conveniently pay with any of these major credit cards. Did you find this page helpful? Be a sweetie and share a good thing! What is the Difference Between an Extract and a Flavor? I often get asked, "What's the difference between an extract and a flavoring?" The names are often used interchangeably however, an extract is generally made from a natural ingredient, for example we have Pure Lemon Extract from made from lemon oil and Pure Vanilla Extract made from real vanilla beans. Pure extracts can have a more limited shelf life and should be stored in a cool, dark cupboard. A flavoring is usually artifically flavored, therefore it's more stable and has a longer shelf life. 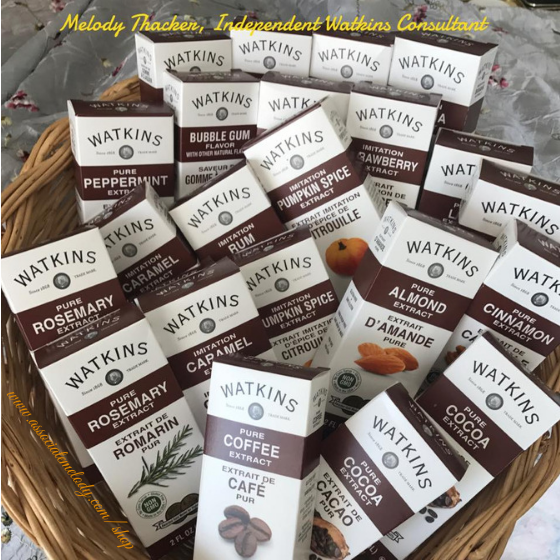 Watkins offers you both artificial flavors and pure extracts so you can choose the one that's right for you. The quality and care Watkins takes in the manufaturing process ensures you that the bottle of extract you buy today, will be just as good six months or several years from now. How Many Calories are in Watkins Extracts? I also get asked about the calories, sugar and carbohydrates in Watkins extracts and flavors. The calorie count, sugars and carbs is generally considered too small to count because you only use a small amount in your recipes. A teaspoon pure extract has 35% alcohol (similar to a 70 proof alcoholic beverage) contains about 12 calories and 0.53g carbohydrates. Baking Vanilla contains 8.25% alcohol and Clear Vanilla has 8.75%. This makes them perfect for diabetics and people who are dieting and counting their calorie intake. These fat-free liquid extracts are economical to use as they are concentrated and add a full, rich true-to-life flavor to a variety of dishes, baked goods and beverages. These all-natural extracts do not contain any artificial coloring and are made from all-natural oils. Available in a 2 oz plastic tinted bottle which protects it from light. All-Natural Pure Almond Extract contains water, alcohol and oil of bitter almond. It is perfect in sugar cookies, biscotti, hot chocolate, coffee cakes, macaroons, cherry pie and baked beans. All-Natural Orange Extract contains alcohol and pure orange oil. It's great for baking and a whole lot more as orange pairs well with many other ingredients. Use it for quick breads, spiced tea, sugar cookies, chocolate goodies, glazed carrots, barbeque sauce, puddings, spice cake and fruit salad. All-Natural Peppermint Extract contains alcohol and pure peppermint oil. It is wonderful in iced tea, anything chocolate, cakes, frostings, cookies, brownies, apple jelly for lamb, and candies. All-Natural Lemon Extract contains alcohol and pure lemon oil. This one is excellent in cookies, zucchini bread, iced tea, lemon bars, lemon drops, blueberry cobbler or muffins. All-Natural Pure Vanilla Extract contains water, alcohol extractive of vanilla beans and glucose. Organic Pure Vanilla contains water, organic alcohol, extractives of organic Bourbon vanilla beans. Use in any recipes that calls for Vanilla. All-Natural Mint Extract contains alcohol and pure mint oil. It is wonderful in iced tea, anything chocolate, cakes, frostings, cookies, brownies, apple jelly for lamb, and candies. All Natural Pure Anise Extract contains alcohol and pure anise oil. It is wonderful in cookies, cakes, frostings, drinks and candies. Watkins Extracts And Flavorings in the 2 oz. Trial Mark Bottle. Add true to life flavors to all your favorite dishes with Watkins extracts and flavors. Two oz Extracts and Flavors, these may contain artifical flavor. Note: Watkins no longer uses artificial color in any of our extracts or flavorings. Every year from September until the end of December Watkins used to have wonderful limited edition extracts in the 2oz. trial mark bottle. Learn more about two of our most requested extracts Danish Pastry Extract and butternut extract here. Uses for Watkins Extracts and Flavorings. Try any of the flavorings and extracts in your favorite recipes for cookies, squares, candies, cakes, puddings, muffins or quick breads. Perk up the flavor of your smoothies, milk shakes, fruit salad, salad dressings, and marinates. The fruit flavors go well in hot tea, iced tea, both fruit and nut flavors make wonderful gourmet flavored coffee, regular or iced, and hot chocolate. Try Watkins famous and ever popular Five-Flavor Cake With Six-Flavor Glaze, it has a delightfully, delicious combination of flavors! Know someone else who would enjoy this recipe? Be a sweetie and share it! Five-flavor Cake: Cream together the butter, shortening, and sugar in large mixing bowl until light and fluffy. Add eggs and beat until smooth. In small bowl, combine flour and baking powder; mix well and set aside. Combine milk and extracts. Add flour mixture to creamed mixture alternately with milk mixture, beginning and ending with flour mixture. Spoon mixture into a greased 10-inch/25-cm tube (angel food cake) pan. Bake at 325¡F/165¼C for 1-1/2 to 1-3/4 hours or until cake tests done. Cool in pan on wire rack for 10 minutes. Turn cake out of pan onto wire rack, invert again. Place waxed paper under rack to catch glaze drippings. Slowly spoon glaze onto top of hot cake and let glaze drizzle down sides of cake. Let cool completely. Makes 12 servings. 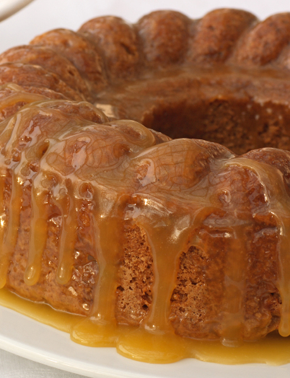 Six-Flavor Glaze: Combine all ingredients in heavy saucepan. Bring to a boil over medium heat, stirring until sugar is dissolved. Ready to shop? Order your favorite Watkins Extracts and Flavorings on our safe secure Watkins website, conveniently pay with any of these major credit or debit cards. Go here to Request a free Watkins Products Catalog.